Bird B Gone, the leader in professional grade bird control products for commercial, industrial and residential applications has announced the release of its new Critter Shield-Motion Activated Sprinkler, a device designed to keep a wide range of animals away from yards, gardens and ponds. 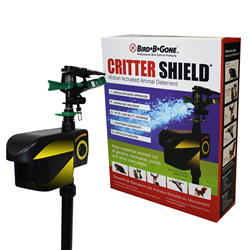 Adding to its comprehensive array of animal control products, Bird B Gone has just announced the release of the Critter Shield ™ Motion-Activated Animal Deterrent. The new device is specially designed to effectively and humanely deter a wide range of animals from yards, gardens and ponds. Property owners and managers need no longer resort to toxic chemicals, pellet guns, or other potentially lethal means to get rid or nuisance animals. A harmless blast of water “educates” critters to stay away. The Critter Shield employs an infrared sensor to instantly detect an animal within its radius of protection. Once detected, it immediately releases a three-second burst of water, pausing for eight seconds before emitting another burst if the animal is still sensed. This pause is designed to make the water blast unpredictable to animals, so they won’t get used to the water blast. The combined noise of the sprinkler head and water burst effectively scares animals away. Working day and night, the versatile Critter Shield will scare predators like cats, birds, dogs, raccoons, rabbits, squirrels, skunks and even deer. Its sensitivity is easily adjusted to deter many different types and sizes of animal intruders. The fan shaped coverage area is 45 feet wide, extends out to 35 feet, and protects over 1,000 square feet of ground. The Critter Shield works for six full months on a single 9-volt battery. To prolong battery life, the device automatically adjusts its sensitivity to reduce false triggering (by windblown leaves, etc.) within five minutes of the first false trigger. The Critter Shied comes with a sprinkler mount and connects in minutes to any standard garden hose. Extra units can be added to protect larger areas.